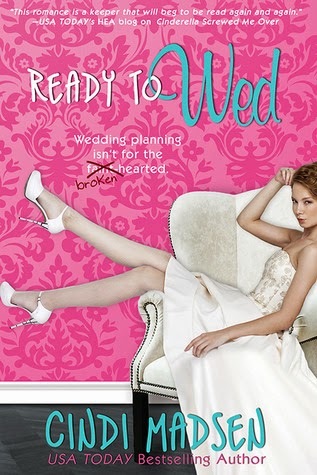 I love a romance like Ready to Wed that is more character driven. You bond with the characters and the lead long before you start yearning for a romance. Plus this story seemed to be unique because it’s sort of a love triangle but not in the conventional way. This is someone who had her life uprooted and now thinks maybe things happen for a reason and she should really figure out if this is what she still wants. Forgiving is one thing but forgetting is something completely different. When you’ve been hurt in a relationship it takes away some of the innocence. You maybe forgive that person but that shadow now exist. I’m not saying you can’t get past it because you can, I’ve had to do it myself. I thought it was interesting to have that component in this story though. Grant isn’t some evil devil but he definitely effed up big time. Does he have a good reason, debatable, did he execute it properly, absolutely not. I really liked the way Cindi handled it. It’s so easy to get stuck on a runaway train to the altar that you might not realize it’s the correct path for you, until after the fact. I’m speaking from experience so I think it’s one of the reason I loved this plot so much. I thought it was super easy to relate to. Dakota is a great character and I loved how the book takes her on a journey discovering what she really wants. I love how well we get to know her and not just from her inner dialogue but also the bond she has with her dad and her best friend Jillian. Also from the trial and tribulations that she goes through with her mother her. Plus her unexpected friendship with Wild Bill. You get to see so many facets of her. I also really like that Dakota is both sporty and girly. The romance in the book is great. I loved how things worked out with the whole Brendan and Grant conundrum. I really loved how the books focus is on Dakota though. Do I think things happened too fast, not at all. Once again speaking from similar experience. Another thing that I loved about this book is that with Dakota’s job as a wedding planner/columnist we get to read her columns. Not only that we get little dips into the events she’s planning. I thought it was something really fun to have in the book. I loved hearing about Doves popping on guest and other things that could possibly go wrong and how she fixes it. This book is so much fun and filled with awesome characters. I really loved it.